The core team — the worker bees — may interact on a daily basis. Other team members may not be able to participate in all activities, but need to be involved from the very beginning and regularly kept apprised of progress. Identifying and enrolling eligible children in health insurance is an undertaking, requiring many skills in order to provide a seamless set of identification, outreach, referral and enrollment information and services for students. As an educator, you already value teamwork in classrooms with and among students and in teachers' and administrators' professional development. The recent Every Student Succeeds Act (ESSA)10 that replaces the No Child Left Behind Act11 supports schools in this role, iterating that integrated teamwork is vital to a well-rounded education. The same principle of teamwork applies here. The key to identifying students without health coverage is asking parents the simple question: "Does your child have health insurance?" A simple question, yes — but it takes the information technology (IT) department to update school databases with the field for health insurance status, make that question part of an annual school district enrollment form, and develop mechanisms to report the results back to the team. Check out CDF and AASA’s Health Insurance Question Template for sample language. The team's strongest advocates are often the school health professionals, including school nurses, who are familiar with sources of health care in your community and will already know children who may not have a regular source of care. Without being prescriptive, teams can also benefit from members representing additional health professionals and paraprofessionals, athletic coaches, family and community liaisons, district public relations/communications staff, school social workers, student support services representatives, school board members, students, and parents or other caregivers. Once the team has been established, a team lead should be selected. The team lead’s responsibilities include program oversight; leading meetings; resolving conflicts; serving as liaison to school personnel including the superintendent, community agencies and families; conducting data review; outreach planning; and more. Building support in other departments throughout the year can be helpful in building your network. You may consider doing presentations to leadership in other departments and to the school board about the health care needs in your district and how their participation in the outreach campaign would help ensure its success. The success of your efforts can be multiplied with more hands on deck! With which other school departments might you connect? Nurses: School nurses are often the first to discover a child is uninsured. Turn to them to help identify children with immediate and chronic health care needs. The Athletic Department: Coaches and staff in the Athletic Department can help identify uninsured children who are having trouble getting required physicals. Migrant Education Program: The school district’s Migrant Education Program staff can help provide additional hands-on support to migrant families such as home visits and assistance linking them to community services. Parental Involvement Assistants (PIA’s) or Parent Liaisons: Parental Involvement Assistants and Parent Liaisons are assigned various roles within the school district and often represent the voice of the parents in school committee meetings and school events. The Public Information Office: Staff can help develop effective messaging, and place announcements online and through social media by incorporating videos. 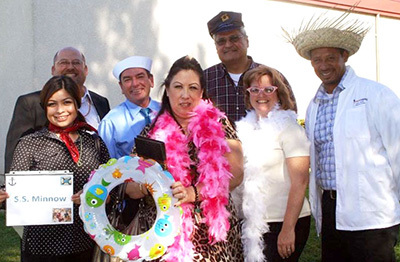 The Mountain View School District in El Monte, CA, creatively built a multi-disciplinary team that included the superintendent, school board members, key school administrators, school nurses, school office managers, community liaisons and health clerks. To build community, establish need, and get buy-in, the district brought key team members “on board” a “Gilligan’s Island” themed-tour of their community. The “crew” boarded a bus for their “three-hour tour,” which took them to visit several local health clinics serving children and families in the El Monte community. At each site, the school district team learned about the great need in their community for assistance with health insurance enrollment, as well as the myriad of services offered to their students. The strongly motivated team then developed a seamless referral process to guarantee that all uninsured children in the district would be connected to the enrollment assistance needed. Successful teams keep things simple and piggyback on systems already in place. Teams need to identify the appropriate routine district forms where a question about a child’s health insurance can be added. The school enrollment form is where CDF and AASA recommend school districts begin, but the school enrollment form may not be an annual form in every district. In some school districts, the emergency contact form, the student health card, or another form is required annually at the start of the year. Learn more about adding the health insurance question to key school forms. Successful teams track data and measure outcomes to evaluate what’s working and what is not. Teams need to develop strong strategic work and sustainability plans right from the start to guide their efforts. Sustainability plans help teams set goals and establish guidelines for achieving and measuring the impact of their activities. Within a sustainability plan, districts should incorporate action plans that will drive implementation for the initiative and capture school district successes, challenges and lessons learned. CDF and AASA encourage action planning because successful teams have a plan — and a back-up plan or two. Successful teams ask questions, take educated risks and are not afraid to modify their plan or their team's composition.